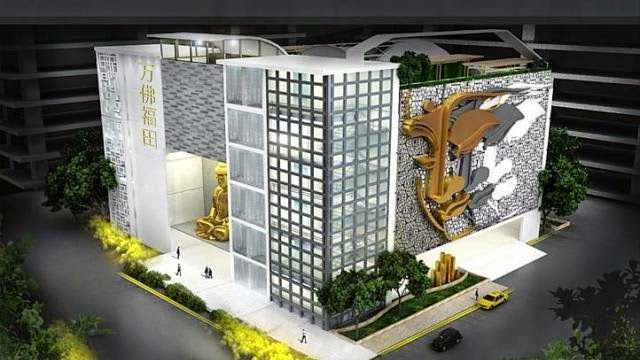 1) The buyers of BTO and residents in Sengkang West are being hoodwinked by HDB's scheming omission of critical material information on this columbarium and using "Chinese Temple" as a decoy. 2) It is totally inappropriate to allow a commercial entity to run a religious entity. I shall elaborate in this article. 3) The columbarium service is supposedly an ANCILLARY service to the Chinese Temple but in the end, it has become the main focus of the commercial entity, an Australian Public Listed company Life Corporation. When a land is gazetted for religious use, naturally it means that it is not for commercial use. Especially in this case, when it says the land is for Chinese Temple, then in Singapore's context, a Chinese Temple is mean to be run by a registered organization or society under Registrar of Society (ROS). A religious organization like a Chinese Temple or any Churches that receive tithes are governed by the Charity Act. According to the ruling of High Court, any organization that advance religion will have to be classified as Charity. The governing body is Commissioner of Charities. However, according to the tender information posted on HDB website, Life Corp has won the tender via a private limited company. 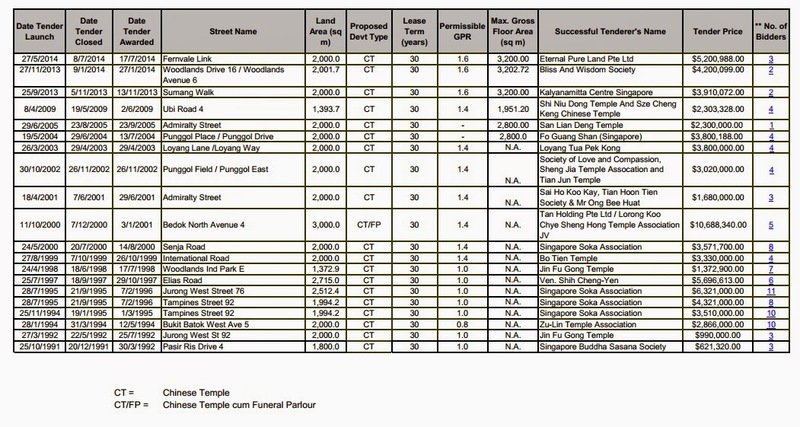 If you read carefully, all other bidders of land meant for Chinese Temple are religious organizations or groups registered in Singapore ROS. 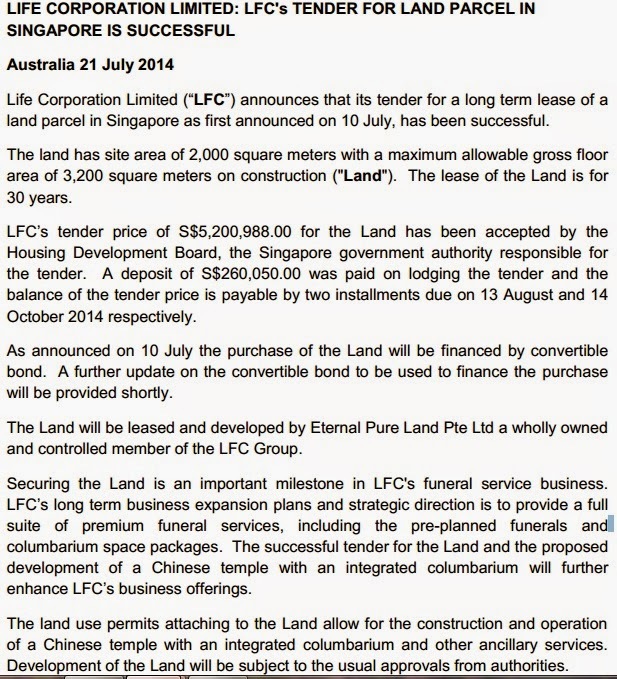 Eternal Pure Land Pte Ltd. wholly owned by Life Corporation, is the only commercial entity which won the tender. Although it tries very hard to have a name that sound "Buddhist" but in essence, it is a private limited company. The only other exception is the land slated for Chinese Temple/Funeral Parlour at Bedok North Ave 4. Even for that, it is a bid offered by a combination of a commercial entity and a temple association. (This may become another big hoohaa for Bedok residents if it is situated right in the centre of the HDB estate but I doubt so. It should be situated near the industrial park.) To provide funeral parlour service definitely need the involvement of commercial entity. Look at the other two bidders for the same plot of land at Sengkang West here. They are both religious organizations registered in Singapore! It is highly inappropriate and most probably against the law/regulation for HDB to allow a commercial entity to bid and win the tender for land meant for religious purpose. In fact, it is utterly disrespectful for HDB to allow a commercial entity to "make money" by using the name of Buddhism here. Throughout the decade, we have seen how Singaporeans are irked by the various scandals arising from inappropriate or mismanage of funds by the respective religious leader of both Buddhist and Christian organizations (i.e. monk Mingyi of Renci and pastors of City Harvet). Funds gather by religious entities are expected to be treated as donations for charity and use in enhancing religious and spiritual cause, other than daily operation expenses. That is why religious groups, be it temples or churches, will need to be governed by Charity Act and the Commissioner of Charities. Especially for serious Buddhists who observe the precepts, we expect monks to be Role Model of human beings and not businessman. We call those who make use of Buddhism to make money or serve their own material desires, "Business Monks". Yes, we do not have much respect for these "Business Monks", other than the fact that they are just human beings in robes. We detest these "Business Monks" who give our belief, the teaching of Buddha, such a bad name. For most Buddhist Temples that provide columbarium service, they provide such service to their devotees as a public service in return for a fee just for maintaining the operation cost of their temples. These are NON-Profit organizations, unlike what Life Corporation and its subsidiaries, Eternal Pure Land and SFS are thinking of. Columbarium is really just an ANCILLARY service while TEMPLE function is the main key focus. It is obvious and expected that Life Corporation as a public listed commercial entity will be more excited and focus in how much money the columbarium can bring it. And to understand it a bit further, SFS is a company that provides PREMIUM Funeral Services with Mercedes as their hearse! It basically means that their services are meant for filthy rich people and I do not think they are going to provide its intended "state of the art columbarium" service to layman. It is basically a very lucrative BUSINESS to them, not the normal PUBLIC SERVICE kind of columbarium offered by traditional registered Buddhist temples. I believe the Singapore Buddhist Federation must be extremely upset and unhappy. HDB has just allowed someone to make use of the name of Buddhism for commercial profiteering. This will ultimately make Buddhism look extremely bad! Buddhism is about the teaching of Buddha, not meant to be used as a commercial front to make money!. This is utterly disrespectful, if not blasphemy in essence. Rightfully so. No one, not staunch believer of any religion, would want their religion to be made used for making money. Religion, is after all, spiritual in nature. I believe the tender for this land should be void and null. This land is only slated for Chinese Temple. It is not meant for commercial use. It is already a breach of the land use and LFC is profit oriented entity which cannot be classified under "Charity". If it was to be classified as "Charity", all its earnings from this Chinese Temple will have to be regarded as revenue for non-profit organization and should not be recorded as earnings for Life Corporation. HDB and URA should do the right thing to right the wrong. It is totally disrespectful for HDB to allow a private commercial entity to make use the name of Buddhism to make money. Technically speaking, Eternal Pure Land should be disqualified for its tender because it doesn't qualify to be the rightful entity to run a religious place of worship, Chinese Temple. It is really unfortunate that for a government statutory board like HDB, it lacks the sensitivity and strict regulation on who can and who cannot bid for land of different usage. Land slated for religious purpose alone will obviously require a more stringent qualification and criteria to make sure that whoever bid for that land, has the necessary qualification and ability to run the intended religious function meant for the land. Coupled with the serious fault of omission of critical material information in its sales brochures, HDB has actually made two terrible mistakes in a row. Although HDB has put up a disclaimer on the brochures but HDB should not shy away from its responsibility of omission. The brochures did not specifically state "columbarium" but only "ANCILLARY" services which was not clearly defined in the brochure itself (only on URA website). I would consider the first fault of disrespectful of Buddhism more SERIOUS than the omission of critical information to the BTO buyers. But nevertheless, HDB should be accountable for both of their mistakes. Null and void the tender to LFC, at the same time, make concessions to the BTO buyers in whatever ways possible. Another Australian company winning a gahmen tender in Singapore??? According to http://www.asx.com.au/asx/research/companyInfo.do?by=asxCode&asxCode=LFC#headlines, ALL the company directors are Chinese, except 1 ang moh, and their names seem too short for Chinese. Who are these people really and what are their true nationalities? Null and void the tender to LFC, at the same time, make concessions to the BTO buyers in whatever ways possible. Nobody is talking about HDB pricing yet. It is about FAIR DEAL with full disclosure of information and the disrespect to a religion. The Sengkang Columbarium saga is NOT going to be the only isolated case here. What they can do to these BTO buyers, they could do it to other Singaporeans in future as well. What they can do to Buddhism now, they can do to other religions as well. This is going to be the case which will set precedence to future. Do Singaporeans agree to such GROSS misrepresentation of sales information by means of omission by property developers, including HDB, in future? Do Singaporeans agree to such GROSS disrespect to religion done by HDB, allowing private commercial entities to make money out of your religion, regardless on what religion it is? Singaporeans have to decide. I understand that govt procurement rules require company to be registered before they can picked up the tender documents. If Eternal Pure Land is registered only a few days before tender closed, how picked up the tender documents? Another point - what was the evaluation criteria used in the tender selection? Did the tender document requirement tenderer to have the necessary experience ? Would be good if the 2 bidders how lost could share the tender documents they picked up. Is there a case of a class action suit by the buyers against the HDB for misleading/misrepresentation?